Finnish architectural design practice Haroma & Partners shares the renowned ethos of clean lines and light which characterises Scandinavian design style. Based in Turku, founding partner, architect and CEO Renni Haroma, explains how he makes a space special. Haroma & Partners’ portfolio is impressive. Since its foundation in 2004, the practice has taken on a variety of projects, from designing hotels, blocks of flats, public buildings and private houses, to renovating old buildings. When describing their style, words like ‘modern’ and ‘minimalist’ come to mind and, in some cases, when it comes to the creation and use of space, even ‘dramatic’. Renni Haroma says that he likes to follow minimalist design as far as possible, but only when appropriate. “There is a time and space for everything,” he notes. At the beginning of a project, Haroma & Partners study the parameters and context of the client’s brief, before deciding what is essential in terms of design. They take into account the surrounding landscape, the layout of the building, its functional purpose and, of course, the client’s wishes. It is through synthesising these different considerations that stylish houses, villas and public places are born. 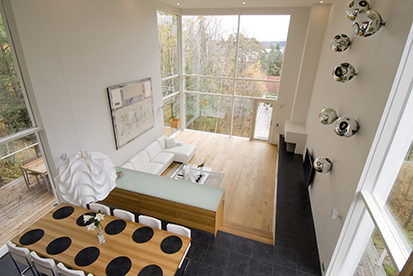 One of the most interesting cases is the conversion of an old Wärtsilä factory in Turku into loft apartments. Some of the original architectural features were retained, helping to maintain the feel of the building. As a result, the apartments are light and spacious, with the 60-year-old red brick walls visible in places as a reminder of the factory’s past and adding warmth to the modern and stylish setting. with stairs leading to a large, wooden terrace, which opens up to a beautiful view of a lake. Imagine waking up to that on a summer morning.